How many cars are in Rogers Park? There are a gazillion cars in Rogers Park, and there’s no place to park them. That’s the declaration you would gather if you listen to “Lakefront Car Tower” (a parking garage) proponents, including the 49th ward alderman, Joe Moore. The parking problem is so bad in Rogers Park that a parking garage at Sherwin Avenue and Sheridan Road that would provide less than 100 overnight parking spaces to the public was actually sent from Asphaltia, the god of car parks. It’s so bad that “[m]any car owners find themselves stuck in their home at night” – yes, the alderman really published that on his website – because they find a parking space on Friday night and can’t move the car until Monday morning. The horror of using your feet, pedals, the bus, the train, car sharing, paratransit, or a Segway! This post is actually a tutorial on how to use United States Census data to find how many cars are in the neighborhood of Rogers Park, not a laugh about Asphaltia’s teachings. In the “topic or table name” field enter “vehicles available” (screenshot). Don’t select any of the suggestions as these represent specific search results that don’t include the search results we want. In the “state, county or place” field enter “60626”, the ZIP code that best represents the Rogers Park neighborhood. The FactFinder website cannot search for neighborhoods or Chicago community areas. Click “GO” and a “Loading…” progress window will appear. Then your search results will appear. Note: It’s not enough to just know how many vehicles are available to Rogers Park (er, 60626) households, we want to compare the change from the 2000 decennial census to the 2011 American Community Survey 5-year estimates. Click the checkboxes next to “DP04” (“SELECTED HOUSING CHARACTERISTICS” in the 2011 ACS 5-year estimates dataset) and “DP-4” (“Profile of Selected Housing Characteristics: 2000” in the 2000 SF3 Sample Data dataset) (screenshot). Now click the “View” button above the search results. In a spreadsheet, make two columns (“2011” and “2000”) and two rows (“households” and “no vehicles available”). Record the number from the 2011 dataset cell called “occupied housing units” into the “households” field under the “2011” column. The value is 21,945. Switch to the 2000 dataset by clicking the right-pointing arrow above the data table. Record the number from the 2000 dataset cell called “Occupied Housing Units” into the “households” field under the “2000” column. The value is 24,259. Now you’re ready to do some analysis! From 2000 to the data collection period of 2007-2011, the number of occupied housing units decreased from 24,259 to 21,945, or a 9.54% decrease. In the same period, however, the number of households that had 1 or more vehicles available to its members increase from 60.2% to 67.4%, or an 11.96% increase. It’s not very meaningful when I report the situation like this. Let me describe it another way. In 2000, 14,604 households had 1 or more cars at their disposal. (The data does not get more specific because one option for the survey respondent is to select “I have more than 3 cars” and a few hundred households selected this option.) In 2007-2011, 14,791 households had 1 or more cars at their disposal. This still doesn’t tell us how many more cars were added to the neighborhood. 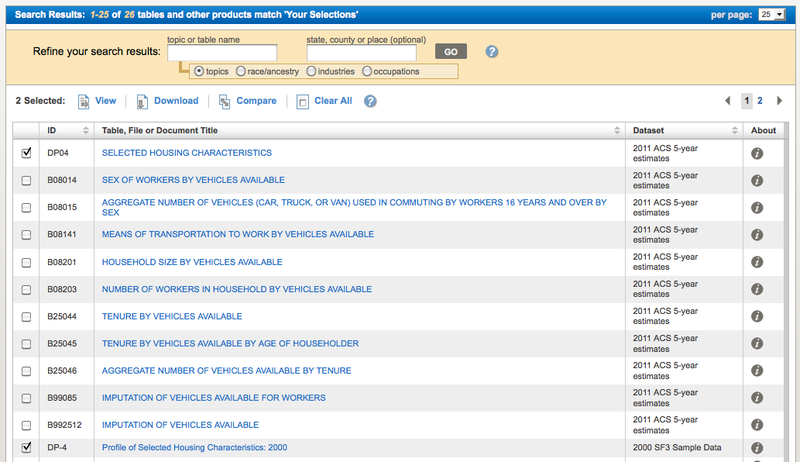 You’d need to look at the other data points (the number of households with 1, 2, and 3+ vehicles available). All in all, 187 households that didn’t have one before got a car in a 10-year period in the 60626 ZIP code. I’ve shown you sufficient information, though, to show that the number of cars in the neighborhood has grown. Needless to say we don’t know where the cars are parked, whether on the street (where it’s free to park), in a parking lot, or in a garage or off-alley parking space.